Kathleen Tessaro is highly underrated in the literature genre; especially in the sub-genre arena for chick-lit/women's fiction. All of her novels have a depth most authors fail to capture, with unforgettable plots that are emotionally impacting. 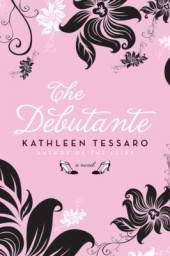 The Debutante is Tessaro's latest novel. Jack is a handsome, though humble antique cataloguing expert sent to the empty Endsleigh House, an estate at its liveliest throughout the 1920s-1930s -- and the home of the famous debutante Blythe sisters. Accompanying him is the beautiful and cryptic Cate, an artist who has recently moved to England to escape her painful past in New York. As if the history of the Blythe sisters isn't intriguing enough (the younger Blythe sister mysteriously disappeared and was never heard from again), Cate's interest is further piqued when she finds a secretive, locked room at Endsleigh. After stumbling upon a hidden shoe-box within that contains an old photograph, a Tiffany bracelet, a badge, and a beautiful pair of dancing shoes, Cate embarks on a mission to uncover new information behind the disappearance of Baby Blythe, learning more about herself in the process. Each chapter in The Debutante is preceded by an intimate letter written by Baby Blythe to her older sister and sometimes, her lover. As the novel progresses, the mystery behind Baby Blythe's disappearance is slowly unveiled. Meanwhile, we are relishing in the sweet and innocent chemistry between Jack and Cate as they make discoveries not only about Endsleigh, but themselves, as each has their own tumultuous past. Tessaro really has a talent for bringing her characters to life and making them painfully human and easy to relate to. The Debutante as a whole is incredibly moving, touching and emotional. Jack and Cate are supremely intense and deep; not at all ridiculous, shallow or melodramatic, making for a beautiful reading experience. If I had to use one adjective that describes my feelings after reading The Debutante , I would say it made me feel wholesome. Tessaro's writing style is exquisite and her vocabulary range is very wide and magnificently descriptive; as you read this novel, you'll be sucked into Jack and Cate's world, and of course the world of Endsleigh itself. My other favorite novels by Kathleen Tessaro are The Flirt (2007) and Elegance (2003). She has also written Innocence (2005). A brief review of The Flirt is featured here: Dreamworld Book Reviews -- The Flirt.